blog.dinogane.com: To-do lists, to-do lists - everywhere. To-do lists, to-do lists - everywhere. I seem to be surrounded by to-do lists. Everywhere where I look, there is another list of things that I need to do. I fly out to Evanston on the 16th August, i.e. exactly a month today. I still have a lot to do. 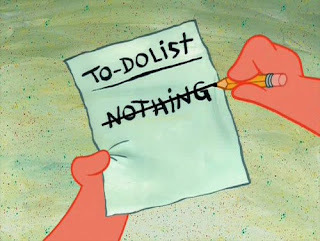 The to-do lists remind me of this constantly. Kellogg's to do list. Kellogg provides a nice list of things to check off. It sits on the welcome site for admitted students. It's very useful. My only fustration with it has been that you can only cross off some things later, because who-ever it is that organises those things has not released the necessary information yet to complete them. Initially we had to wait for the online courses. More recently, it has been the applications to waive courses. However, things have changed recenty: now pretty much everything is available for completing. Now the problem is finding the time to do all that I have left. My personal to-do list. This to-do list includes things such as cancelling my phone contract and buying suitcases. I also need to figure out which items I'm going to pack for Evanston, which items I'm going to chuck away and which I'll leave with my parents. I also want to get back in touch with a number of people I've not seen in a while, before I leave the UK. It's been 8 years since I've seen some people from my undergrad; better to get in touch now, rather than after 10 years (post-MBA) or later, I reckon. Am I getting the most I can out of my venture capital internship? I've not started on this to-do list, but I'm keen to get as much out of my internship as possible. I've learned a few things about how companies are selected and gained a great view of the politics of deal making, but there is still plenty more I could get out of this experience. Perhaps meeting potential future partners and investors? Starting the business. The items on this to-do list include: Building the prototype, finishing the business plan and finding contacts in Evanston to help with sales and building the product. Soon to be added will be that I also need to start thinking about potential target customers and funding sources. If I am going to fund working on the startup over the 2010 internship period, all of this will be important. Emails to reply to. There are a whole stack of people that I've been in touch with one and off. It plays on my mind that I still need to reply to some of them. The problem with replying immediately is that it encourages them to reply immediatly, meaning I have to take more time to write another email sooner rather than later. Delaying replies to save time is an awkward and embarassing time management strategy... but it kind of works. Things to do once there. Unpacking, setting up the apartment, setting up bank accounts, utilities etc and even buying a bathrobe are all on this list. I keep thinking that there must be a lot that I've not thought about, because this list is not particularly long. Perhaps this is because I've bought all of the furniture off a leaving international student? Or perhaps I've not quite immersed myself in the reality yet. There's a lot to be done before school starts. I better get back to getting on with it. Thought you would enjoy the read. This is an excellent link for the kind of thing I'm looking at, startup wise. And very useful. Thanks! Yeah, seems like the to-dos never stop. As soon as I finish one thing, I have 10 more. Welcome to the world of graduate school.